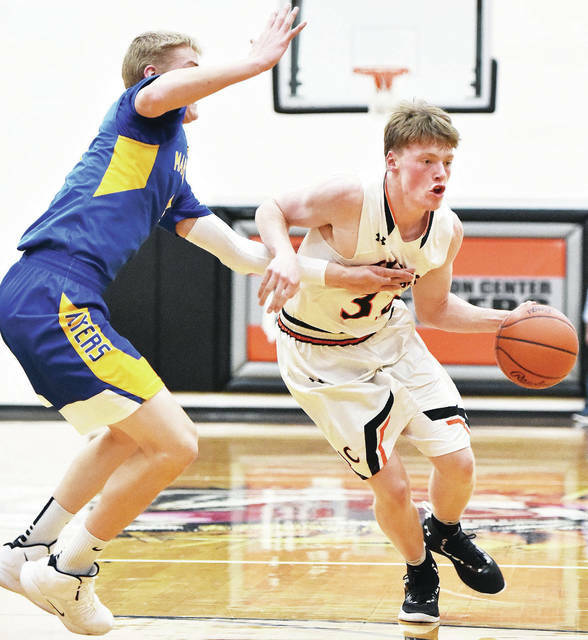 Jackson Center’s Christopher Elchert dribbles with pressure from Marion Local’s Alex Eyink during a nonconference game on Monday in Jackson Center. Jackson Center's Jerron Reese shoots during a nonconference game against Marion Local on Monday in Jackson Center. Jackson Center's Garrett Heitkamp passes around Marion Local's Nick Tangeman during a nonconference game on Monday in Jackson Center. Jackson Center's cheerleaders take the floor before the start of the boys basketball game against Marion Local at Jackson Center Monday. 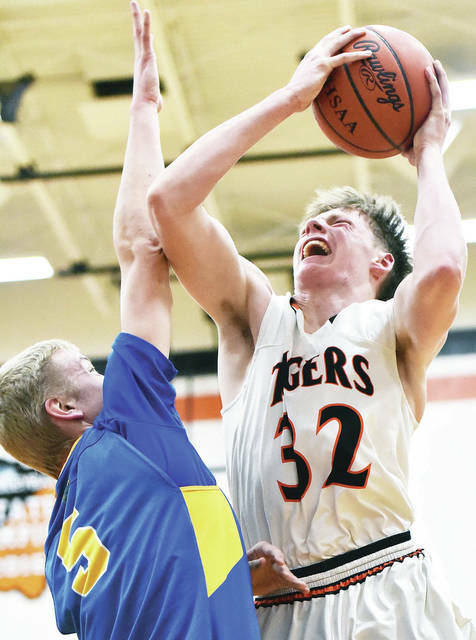 Jackson Center’s Aidan Reichert shoots with pressure from Marion Local’s Sam Huelsman during a nonconference game on Monday in Jackson Center. Jackson Center's Trent Platfoot shoots during a nonconference game against Marion Local on Monday in Jackson Center. 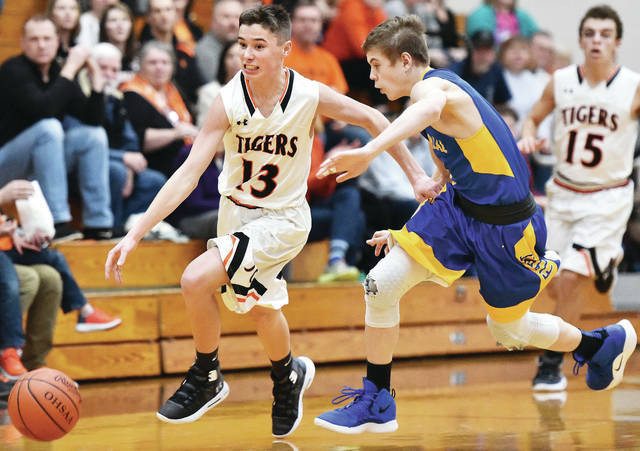 Jackson Center's Christopher Elchert dribbles with pressure from Marion Local's Kyle Francis during a nonconference game on Monday in Jackson Center. Jackson Center's Aidan Reichert dribbles against Marion Local's Nathan Bruns during a nonconference game on Monday in Jackson Center. 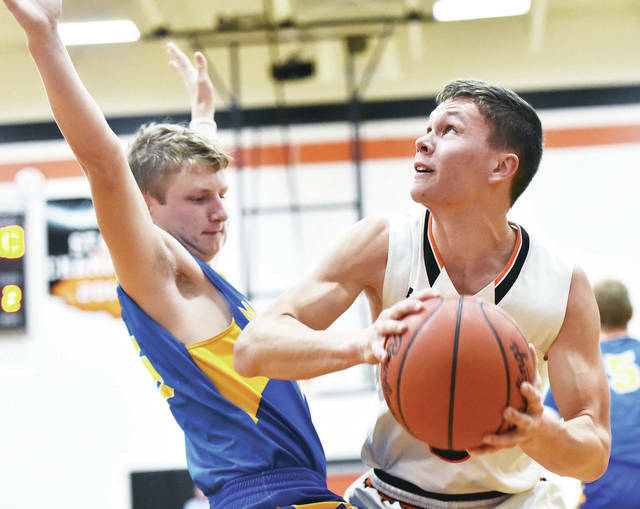 Jackson Center's Aidan Reichert shoots with pressure from Marion Local's Nathan Bruns during a nonconference game on Monday in Jackson Center. Jackson Center's Trent Platfoot looks to get past Marion Local's Kyle Francis during a nonconference game on Monday in Jackson Center. View more photos from Marion Local at Jackson Center here. 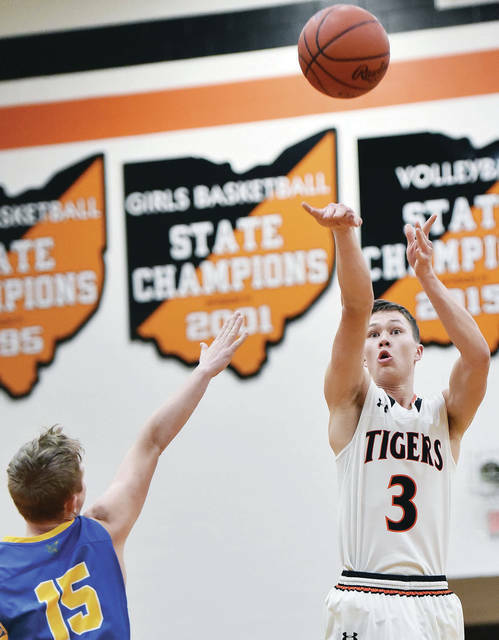 JACKSON CENTER — Jackson Center outscored Marion Local 9-2 in overtime of a nonconference game on Monday to knock off the defending Div. IV state champions. 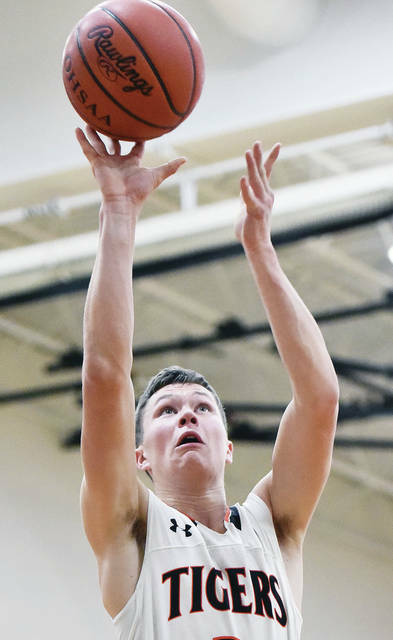 Aidan Reichert made a 3-pointer in overtime and Trent Platfoot, TJ Esser, Christopher Elchert and Garrett Heitkamp combined to make 6-of-9 free throws. Reichert led Jackson Center with 12 points while Platfoot scored 11. The Flyers led 8-5 at the end of the first quarter and 13-11 at halftime. Jackson Center used a 10-8 scoring advantage in the third to tie it and both squads scored seven points in the fourth to send it to overtime with a 28-28 score. Nathan Bruns led Marion Local with 20 points. The Rockets had no problems against Miami East in a nonconference game on Monday in Anna. Anna took a 28-8 lead by the end of the first quarter and led 47-16 at halftime. Griffin Doseck led Anna with 20 points. Carter Elliott added 14 points while Riley Huelskamp and Bart Bixler each scored 10. Five other players scored for the Rockets. A surging Mechanicsburg beat Riverside 63-32 in a nonconference game on Monday. The Indians, which have won five of their last six, took a 20-6 lead by the end of the first quarter and led 34-22 at halftime. They closed out the win with an 11-8 scoring advantage in the third quarter and an 18-2 scoring advantage in the fourth. The Pirates shot 11 for 28 (39.3 percent) from the field and committed 35 turnovers. “Mechanicsburg is a really good team, there’s a reason they earned the No. 4 seed in our sectional,” Riverside coach Bryce Hodge said. “Their aggressive physical defense gave us trouble all night. …It’s hard to win games against any team when turning it over that much, let alone a really good team like Mechanicsburg. Dana Jones led Riverside with eight points while Lauryn Sanford, Kirstin Schlumbohm and Courtnie Smith each scored six. Sidney’s bowling teams hosted Greater Western Ohio Conference American North Division rival Greenville for senior night on Monday at Bel-Mar Lanes. It was both squads’ final regular season match. Sidney’s boys team defeated Greenville 2,280-1,871 to improve to 13-5 overall and 10-5 in conference play. Calib Nolen had a 362 series, Harrison Fisher had a 207 game and Kaden Abbott and Jaxon Rickey rolled one a 203 game. The girls lost to Greenville 1,717-1,631 to fall to 4-14 and 3-12. Camryn Smith had a 332 series, Emma Hurley had a 319 series and Cassie Trudea had a 223 series. Jackson Center’s Jerron Reese shoots during a nonconference game against Marion Local on Monday in Jackson Center. Jackson Center’s Garrett Heitkamp passes around Marion Local’s Nick Tangeman during a nonconference game on Monday in Jackson Center. 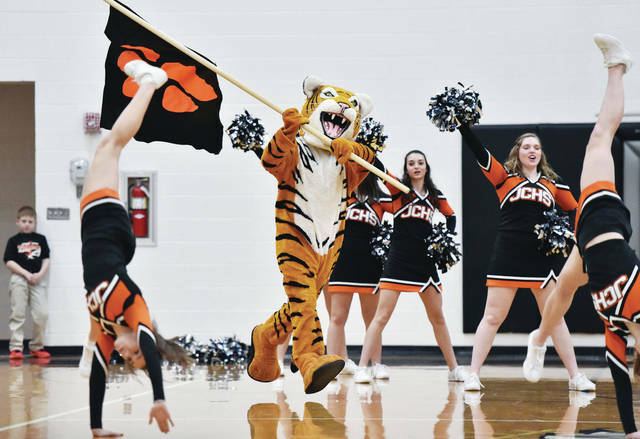 Jackson Center’s cheerleaders take the floor before the start of the boys basketball game against Marion Local at Jackson Center Monday. 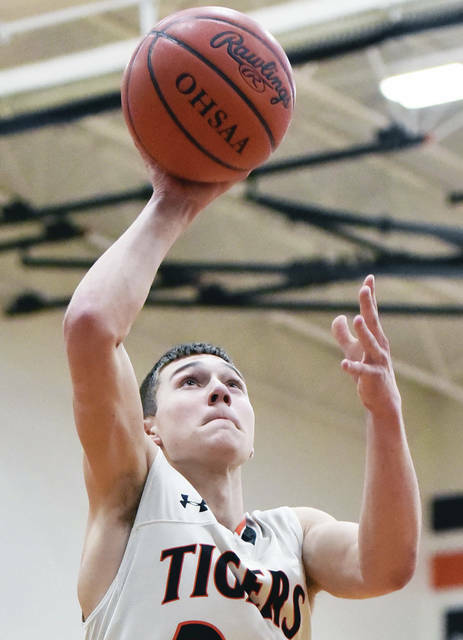 Jackson Center’s Trent Platfoot shoots during a nonconference game against Marion Local on Monday in Jackson Center. 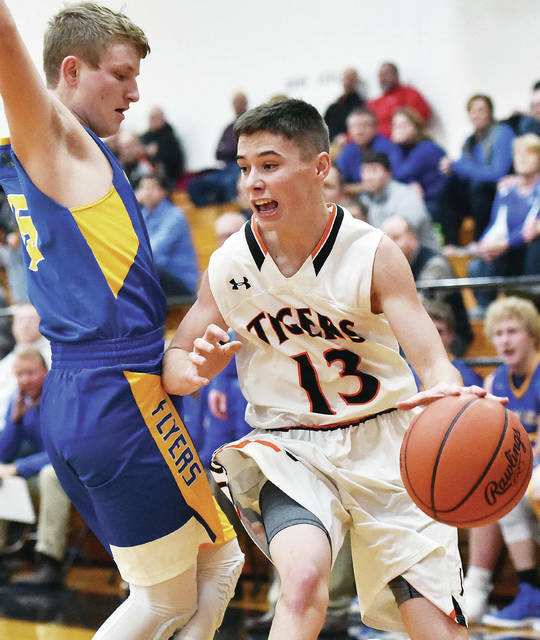 Jackson Center’s Christopher Elchert dribbles with pressure from Marion Local’s Kyle Francis during a nonconference game on Monday in Jackson Center. Jackson Center’s Aidan Reichert dribbles against Marion Local’s Nathan Bruns during a nonconference game on Monday in Jackson Center. 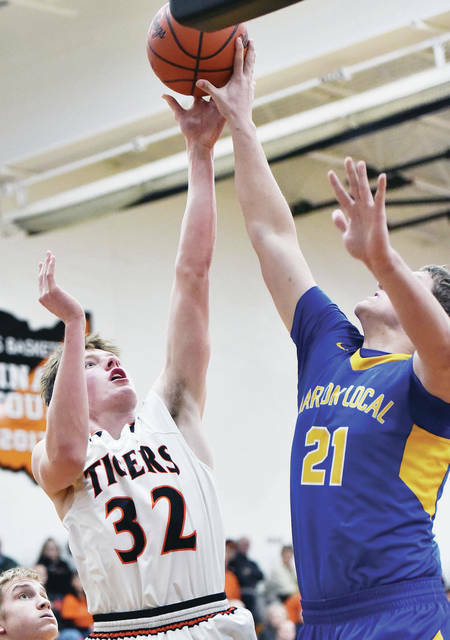 Jackson Center’s Aidan Reichert shoots with pressure from Marion Local’s Nathan Bruns during a nonconference game on Monday in Jackson Center. 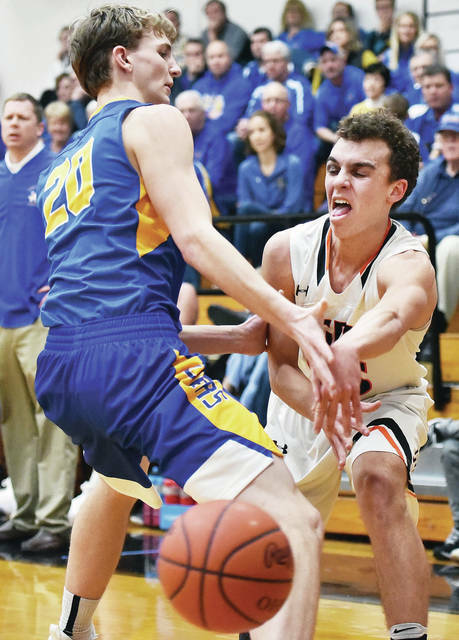 Jackson Center’s Trent Platfoot looks to get past Marion Local’s Kyle Francis during a nonconference game on Monday in Jackson Center.